Philadelphia Flower Show 2019: Craving Spring time? Discover the Power of Flowers at this year’s Flower Show! The Philadelphia Flower Show 2019 begins Saturday, March 2, 2019. Excited? We certainly are! And can hardly wait for this year’s flower show. Sponsored by the Pennsylvania Horticultural Society, the flower show is an annual event. Held at the Pennsylvania Convention Center in Philadelphia. So, this makes the Flower Show the largest indoor flower show in the world! The Flower Show runs until Sunday, March 10, 2019. The nation’s first flower show was held in 1829 in Philadelphia. The theme of the Philadelphia Flower Show 2019 is Flower Power. The Flower Power theme pays tribute to two events. The impact of flowers on people and the Woodstock Music Festival 50th anniversary. First, the incredible impact of flowers on our lives. Studies on the power of flowers have been conducted over the years. The findings of these studies only confirmed what many of us have known. That there is tremendous positive effects of flowers and plants on people. The power of flowers is why so many of us are drawn to flowers and plants. We recognize the value of flowers and always seek them out. Published results of these studies revealed that the effects included happy emotions, increased creativity, and increased productivity. Second, the celebration of the 50th anniversary of the Woodstock Music Festival. Billed as Three Days of Peace and Music. Held on a dairy farm in the Catskill Mountains in 1969. The Woodstock Music Festival was during the “Flower Power” era. The three day festival, “Woodstock 50” is planned to honor the 1969 event. “Woodstock 50” will take place at Watkins Glen, 80 miles from Syracuse. The event dates are Friday, August 16 thru Sunday, August 18, 2019. This year, visitors will learn about the impact that flowers have. And how flowers transport a wide range of emotions and messages. Flowers truly do transcend cultures and borders. Our love of flowers and gardens is shared by many people from many countries and cultures. You’ll find many displays of breathtaking gardens, landscapes, floral arrangements, and floral decor on the show floor. Hosted at the Flower Show, visitors will find the FTD World Cup 2019 floral designs. The Florists Transworld Delivery World Cup is a floral design competition. Competitors from different countries create four floral designs. Find the competitors’ floral designs displayed at the flower show. Last year’s event in 2018 was the Wonders of Water theme. Flower show visitors viewed the life-sustaining connection between horticulture and water. The Philadelphia Flower Show 2019 is at the Pennsylvania Convention Center. Located on 12th and Arch Streets in Philadelphia, PA.
Tickets to the Philadelphia Flower Show can be pricey. Save money by purchasing your tickets in advance. The cost of tickets vary based on attendance during weekdays and weekends. Pricey but worth taking a look at if you’ve never been or you are in the Philadelphia area. There are many great restaurants, museums, and shopping stores in Philly as well. 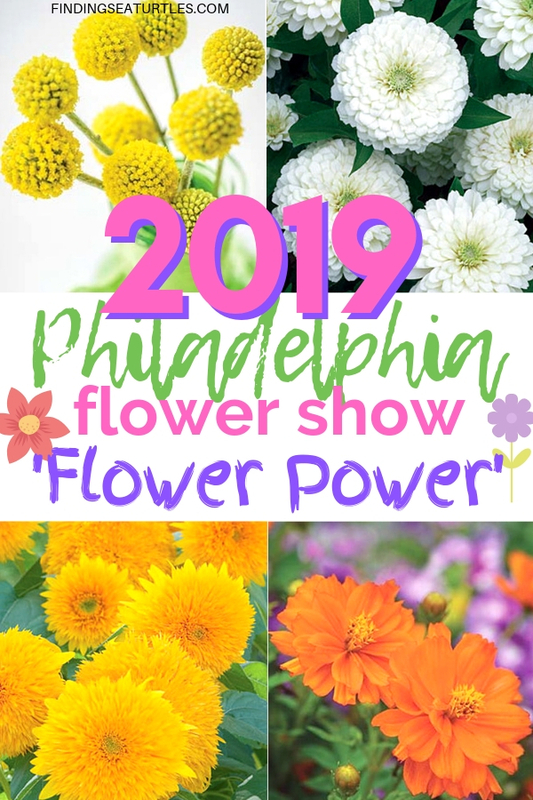 If you attend the Philadelphia Flower Show 2019: Discover Flower Power let us know how you make out. And if you have any questions, feel free to reach out to us in the comments below. We always are ready to help you out. Thank you for dropping by.